I wanted to understand what Christian friends think of the Noah's flood mentioned in bible? Was it real? did it really happened or has nothing to do with reality and just a myth ? Iffo, I am sure I also explained this before, in fact several times. The story of the flood in one of several flood stories around in the ancient Middle East, all quite similar to each other, but there are also significant difference. The most well known is the Gilgamesh epic. The presence of this theme in various cultures suggests an event of a flood long ago that in time generated the stories, and today the general consensus is that this event was the flooding of the Black sea. The straits of the Bosporus are only about 10000 years old, and remains of houses and tools, as well as skeletons of domestic animals have been found on the bottom of the black sea, not at the edges, but almost in the middle. Once the black sea was a much smaller fresh water lake, and when the Mediterranean sea broke through the tiny barrier of the Bosporus (where Istanbul is today) it was flooded. To the locals living near it it must indeed have felt as if the whole world was being flooded. It is also no coincidence that the alleged landing place of Noah's ark is in modern day Turkey. So the story of Noah is inspired by these events in pre-history, as is the Gilgamesh epic. Whether there really was a Noah is doubtful, and the story does not really intend to tell you historical events. It is more of a folk tale, drawing on story traditions in the region and putting together something to convey a religious message. It is a story about how trust in God can be a saving grace. It is telling us God's anger is short and he makes a commitment to his creation even though people on the whole are not deserving his care and his love. Is is "real". That depend what you mean by real. If it means anything to you it is real. I learn every day from you Manfred. Thank you. manfred wrote: Iffo, I am sure I also explained this before, in fact several times. As it was in the days of Noah, so it will be at the coming of the Son of Man. 38 For in the days before the flood, people were eating and drinking, marrying and giving in marriage, up to the day Noah entered the ark; 39 and they knew nothing about what would happen until the flood came and took them all away. That is how it will be at the coming of the Son of Man. 40 Two men will be in the field; one will be taken and the other left. 41 Two women will be grinding with a hand mill; one will be taken and the other left. Iffo, you really can't tell Christians what they must believe, just so it fits with your ideas about Christianity. Have a look at the chapter in Matthew before acting as if you are in a position to tell Christians what to think or believe. The section you got that from is about JUDGEMENT DAY. Jesus is making an analogy between judgement day and the story of Noah. Nobody knows when it will be, and just as in the story of Noah it will be a complete surprise. The section makes no claim at all one way or the other about any historical Noah. It merely uses the well known story to provide an analogy. Suppose I describe someone to be "as strong as Hercules" does that really mean I suggest that Hercules was a real person? Have you ever said "it was hell in town today"? Does that mean you confirm there is a hell with a devil and pitchfork? manfred wrote: Iffo, you really can't tell Christians what they must believe, just so it fits with your ideas about Christianity. Because it says "in the days"? Well, as I pointed out, we are quite sure that a flood event really did take place, the flooding of the black sea. We also know that this event in the distant past had many different myths attached to them. So "the days of Noah" are merely a shorthand too refer to the flood and the way it was talked about by the Israelites. So when you say "age of Ultron" does that mean there really was an Ultron? When I say "the good old days" does that mean I believe people in the past had a better life that we have today? I cannot say "day of the triffid" without being accused of believing in man-eating plants? People often call it "Snow White's castle", others say it is "Cinderella's castle". Does that prove that people really believe in Snow White or Cinderella? They are, after all pointing to something real, right? The reality of the castle is much more mundane. 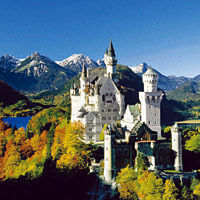 It was build by a quite mad king of Bavaria who almost bankrupted his country in the process. Com'on iffo. You are far more intelligent then that. Read what manfred tries to convey. It is more about symbolism of given story, then the story itself. Read between the lines and look at the whole forest instead just the trees. Symbolism has existed since homosapiens started living in organized groups. Each ancient society everywhere is soaked with symbolism. As for your claim "god" chose only 1% of humanities. Again. All ancient societies encountered same natural phenomenon in their daily lives. Each interpreted them in different way, and gave them different name. Jews, Christian & Muslims called it "god", while Chinese label it xi (energy), and Hindu use "spirit" to define same phenomenon. When you use symbolism you don't say it like "in the days of Noah" unless you are talking about an actual event which took place in the past took place or you have some communication problem. "Back in the days of Ali baba and 40 thieves " you don't talk like that. Anyway what are we arguing for,its not important. Jesus said it happened and you also believe it happened, so that settles it. Only question is why god became so crazy and upset and out of his mind that he decided to punish animals as well with no fault of their, those poor animals running around left and right in panic were innocent. When you use symbolism you don't say it like "in the days of Noah" unless you are talking about an actual event which took place in the past took place or you have some communication problem. "Back in the days of Ali baba and 40 thieves " you don't talk like that. Good grief... is there any chance of you ever reading anything I tell you? I gave you example of similar uses of language. I don't know if Jesus thought there was a Noah or not, he never said. But this phrase certainly is no evidence that he did. We take about "the age of the renaissance" and the "age of reason" and "the Stone age". By renaissance we don't literally mean anyone or all people were reborn, not by age of reason that before and afterwards everybody was stupid, and when we say stone age we don't mean nobody used stones ever since. When I say "the dark ages" does mean I really believe the sun never rose for centuries? We don't have a communication problem at all... the "days of Noah" are simply "during the days of the ancient flood, when the story of Noah was set. Anyway what are we arguing for,its not important. Jesus said it happened and you also believe it happened, so that settles it. No, iffo, you said that Jesus meant something you want him to say, so that does not settle it. The only question is when you reach absurd conclusions why do you not check your assumptions. I have explained the origins of the Noah story to you, so that question assumed it is something it is not. There are obviously lots of things that make it clear that it is some sort of myth... EVERY animal in ark? ALL the world flooded? ONE man builds a ship to carry all that without power tools? IS that not telling you something? The Bible OT/NT is a book full of myths, fables and fairy tales. Batam wrote: The Bible OT/NT is a book full of myths, fables and fairy tales. Why Batam? Please explain. And do you like the Koran better? I respectfully will have to disagree with you manfred. Your analogies are not correct. You don't use the words back in the days for a myth, its that simple. Stone age was actual period that we call "stone age". It was not a period in a myth or was a myth. "Back in the days of Muhamamad", "Back in the days of world war 1", "Back in the days of great depression" that all make sense . What does not make sense is "back in the days of Aladdin". Jesus saying "Back in Noah's days" , means he believed Noah had existed and there had been a flood. He was referring to an actual event. If you agree that Jesus spoke the truth, then the question of the Noah story cannot be disputed, and can be taken as an actual historical event, which fits the Biblical narrative. The question for you Iffo is, do you believe Jesus was speaking the truth on this or not? If you accept that Jesus was not speaking the truth on this matter, then that means he was either a liar or deluded, which in turn would refute everything the N.T.and even the Quran has to say about Him. No it simply does not say that. He may have believed that (or rather Matthew the writer) I really helps if you read even the just afew words further on before you put words into Jesus's mouth. What is going on here? Can your really not see it? The "days of Noah" are the same as the "day of the flood". The whole passage, if you read it is not about Noah at all. It is about "judgement day". Jesus makes an analogy to Noah and judgement day. He says it will be a shocking surprise as it was in the story of Noah. Does that kind of comparison require you to assume that Noah as such was real? Of course not. "Something will happen similar to the events in this story." That is what he is doing. Noah at the time was part of the folklore, and to many quite real, so using a phrase like that really is not at all surprising. I am sorry to have tell you that no Christian has ever nor would ever use these two words is a sentence to suggest Jesus believed in a real Noah, or not, as the case may be. That part we simply do not know, he may or may not have done. Today we are quite certain he was not a real person, and there no requirement in Christian doctrine to believe otherwise, and the passage from Matthew makes perfect sense either way. You only find the literal reading of Noah today in fundamentalist fringe groups, mostly in the US. "Just as the Sith mercilessly wiped out the Jedi, so terrorists mercilessly killed civilians on September 11th." I don't believe the Sith and Jedi exist simply cause I use it as a metaphor. "Bush bombed Iraq back into the stone age." That was a phrase you could hear often at the time. Literally? Please have a look at this article about the "golden age". So believe what you must. I am quite certain on this point you are wrong. But if this is something you feel strongly about, perhaps you want to show me where Jesus claimed explicitly that Noah was real, like Mohammed did when he said he met him. I will tell you that that I have given you the view on Noah as held in the Catholic and Orthodox churches, as well as the Anglican and Lutheran and many other protestant denominations. As I have also told you frequently, the NT are early Christian texts. You cannot rewrite them in some way and then claim this proves how silly Christianity is. The yardstick in not your reading of it, but how it is generally understood by Christians. SAM, you should probably notice that Jesus is only quoted (above) as saying "in the days before the flood" and 'until the flood came" thus tacitly confirming the flood, but not any of the details. Don't expect the Bible to be ACCURATE history but it does contain some historical facts. Today, most Christians (as far as I can tell) don't believe in the literal truth of all the Bible stories -- the Bible doesn't demand that as the Qur'an does. Many Christians did get hung up on 'evolution' as do Muslims, and this is very dangerous for their faith since requiring the scripture to be literally true opens the door for proving them false rather easily. HerbM wrote: SAM, you should probably notice that Jesus is only quoted (above) as saying "in the days before the flood" and 'until the flood came" thus tacitly confirming the flood, but not any of the details. I am sure 9/10 unbiased people will find your explanation not convincing. Jesus did not have to use the words "Back in the day's" about an event which never took place. I personally don't care what Christians believe. I am only interested in brutal truth and honesty. I am sure 9/10 unbiased people will find your explanation not convincing. Have you heard of the "no true Scotsman fallacy"? This is a perfect example. "No true Scotsman would do that. " When one is actually found who does the disputed thing, you say "oh, if he does that he cannot be a TRUE Scotsman, as they don't do that." So "unbiased" people don't believe what I tell them you categorically state. Well, if some person actually does, then you will say he is biased, he has to be, because you said "unbiased" people simply don't do that. That way you fulfil your own prophecy. I have told you what you would hear in any first year theology course about Noah, and pretty much in any university in the world, and what pretty much all Christians teachers would say, with the exception of a few fundamentalists. But, hey, why argue, you clearly know better..
Jesus did not have to use the words "Back in the day's" about an event which never took place. Did I say that? For the umpteenth time, the FLOOD is a real event, we have very strong archaeological evidence for the flooding of the Black sea. NOAH (and all the other stories) are legends built around that event, mostly with specific teaching points. The flood has become "legendary", literally, a part of a legend. Noah and flood are linked. That is how you can use "the days of Noah" and "the days of the flood" interchangeably, just as Matthews gospel actually does. Surely you know what a metaphor is? You say you are not interested in Christian beliefs but you seem to like presenting them inaccurately and then ridicule them. In that you are really quite similar to SAM.